Born in upstate NY, Karen grew up in NJ and moved to Missoula in October 2008. She graduated from the Somerset School of Massage Therapy (now a Cortiva school) in June 2003 and received the practical valedictorian award for her class. After graduation, Karen tested and received her national certification through NCBTMB. Karen was invited to work as a massage therapist for the Rutgers collegiate swim team at the Big East Championship in Hempstead, NY both as a student and two other times after graduating. Providing volunteer massage service alongside her former instructor, Brian Smith, she had the opportunity to provide massage to a group of cyclists that road cross-country raising money for the 911 Memorial Fund through Airline Ride Across America. Karen maintained a therapeutic massage office in NJ for five years before her move west to Montana. A huge proponent of continuing education, she is always looking to further her training in the massage field. Karen is certified in Neuromuscular Therapy and received her Reiki Master in December 2012. 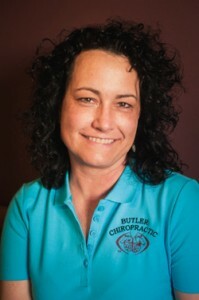 She continues her studies in Myofascial Release and CranioSacral Therapy. She has also had the opportunity to complete continuing education workshops with such industry leaders as Aaron Mattes and Paul St. John. As a horse enthusiast, Karen competed in combined training events back east and was certified in 2002 by Equissage, Inc. in equine sport massage therapy. It is her hope to enjoy the beauty of her new home state through hiking, kayaking and just wandering around Montana on horseback or in a boat. Karen teaches Deep Tissue and Sports Massage at the Montana School of Massage. Call our Missoula office today at (406) 728-5114 to schedule a massage with Karen.